Warning: This story certainly shows the darker side of social media and the contents are of sensitive nature. So last night as I was relaxing at home, flicking through my Facebook newsfeed – I noticed one particular post getting a lot of attention and commentary. Looking a little closer I saw this was indeed a home grown Australian story, and one that would provide a valuable lesson for many young people using social media (or walking out in public for that matter). A young, attractive Newcastle lady was out with some friends on the Gold Coast at the Surfers Paradise Beer Garden. We’ll say this young lady goes by the name of ‘Demi’. Obviously they had all been having a few drinks, and the local nightclub photographer came around for a picture. Not the best picture.. And we all know how quickly things can escalate on social media. I noticed this photo started getting lots of likes, comments and shares from other people in Newcastle and Australia. It then got to a point where friends of the girl in the photo – tagged her! 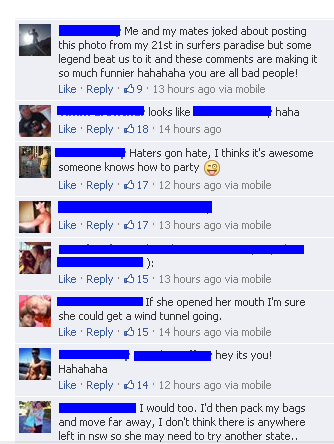 It didn’t take long for users to start commenting and unfortunately throwing around hurtful insults. 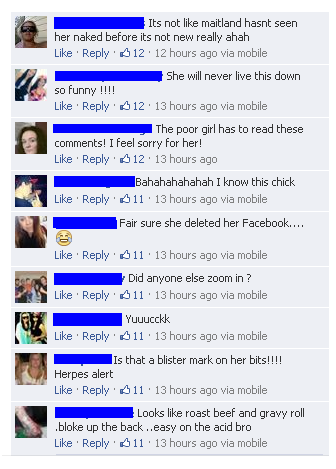 Some people ended up spending a lot of time on the thread just tagging their friends and commenting over and over. That is really taking things way to far. Due to the amount of tagging in the photo and comments – one minute you could click onto Demi’s personal profile, which revealed a profile picture wearing the exact same shorts. The next minute the profile was gone – no doubt because she deactivated or deleted her Facebook account. I think you would be pretty shocked after seeing this happen on Facebook. I am not trying to make things any worse for Demi but more so post this as a warning what could happen to anyone out there – all it takes is one little mistake and you have made social media fame, in a bad and horrible way. For Demi’s sake I hope she is all good and can brush this aside. 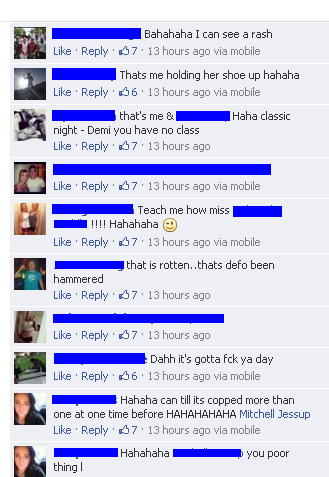 Everyone makes mistakes and some of these Facebook comments have gone from a joke to just plain insulting.